Citrus is synonymous with the state of Florida. The state’s license plates are adorned with the orange. The football stadium at the University of Florida was named for a magnate in the orange business. There is even a state county named Citrus. Across the decades, the industry has stood its ground – through hurricanes, freezes and huge development. However, now the industry, which is worth $9 billion, is facing what is considered its biggest threat to date, putting the economy of the state at risk as well as its identity. A bug, which is no larger than the head of a pencil eraser, is the cause. The brown bug carries a disease that kills the oranges. The problem was discovered first in China and called huanglongbing: yellow dragon disease. The citrus industry in Florida simply calls it greening. The disease arrived via the Asian Citrus Psyllid, an invasive bug, which carries bacteria that are left behind after feeding on leaves. The tree will continue producing usable fruit, but eventually the vascular system is clogged by the disease, fruit falls and the tree begins a slow death. The psyllid is not native to the state of Florida, but it believed to have been unknowingly transported by an individual who brought from Asia a slip of tree. Some believe it was then spread through winds of hurricanes over a decade ago. Greening has no cure, and it has not been eradicated in any country. All of which has the citrus growers in Florida doing everything possible trying to find a way it can be stopped. One grower said it was like being in a war. The farmer said he estimates he spends more than $2,000 per acre on his 5,000-acre farm on costs of production, which is an increase of 100% from a decade ago. A great deal of that cost is towards spraying and nutrients trying to control the psyllids. 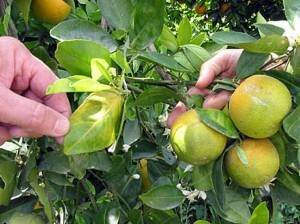 Close to all the citrus groves in the state, have been affected, to differing degrees by the greening. Researchers, experts and growers all agree that the crisis already had started to compromise the prominence of Florida as a region for citrus growing. The state is second to Brazil in the world in juice oranges, producing close to 80% of the U.S. orange juice.